Here is why I should not do freehand manis - just look at how I've ruined this one with my incredibly unsteady paws! I'm not even going to try to explain this mani or give you a how-to. If you can identify those rather indecipherable squiggles, you need to go join Mensa. The base I used is O.P.I. Thanks a Windmillion, following up with nail art pens. I also fished out a heart glitter on to each nail from O.P.I. 's Heart To Resist. I pulled out O.P.I. Suzi Says Feng Shui - pictures look lighter and brighter; it is a slightly deeper blue, but a dustier one - and tried out fewer elements with the Konad nail art pens and ended up with a second mess on my hands digits. The natural-light picture to the right is truer than the direct sunlight picture to the left. I'm going to revert to my favourite stamping tomorrow and give Hallowe'en another go on my nails. Fingernails crossed, it should look a jolly good sight better than either of these. Both these manis are my entry to the Hallowe'en Nail Art Challenge hosted by Kitty's Painted Claws and Racho's Nail Love (links in the thumbnails below). Which one of the two did you think was less uggerly? 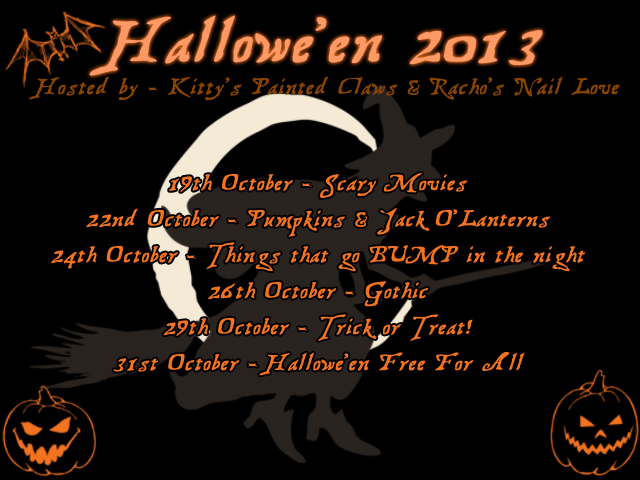 The rest of this month's blog posts - just two more, then - are going to be devoted to Hallowe'en manis (though it leaves me with time for little else). To disturb you for the rest of the day, here's one more dekko at the first freehander I came up with. Do you think I need to be psychoanalysed a la Hannibal Lecter?